Everyone thinks getting a puppy is all fun and games. You get a cute bundle of joy to play with, she snuggles with you; what more could you ask for? What could go wrong? In complete bliss, you might even forget that you’re going to be dealing with those sharp puppy teeth chewing on just about everything within just a few weeks. The blissful start of ownership has passed! It’s time to get some chew toys! For many new pet parents, the sheer number of toys on the market can be daunting. What’s worse, you could buy a toy and your puppy may not even like it. How do you choose the right toy that’s both safe and fun? 2 What Toys Do Dogs Really Want? 4 What Makes the Best Teething Toys for Puppies? While all of these brands recommended are safe for teething puppies, it’s still important to do your own due diligence. If you notice your puppy is tearing up non-edible toys, remove them before they can break off bite-sized pieces. Even with edible chews, always make sure you take the treat away when it becomes a choking hazard. You can also hold it to ensure your puppy takes small enough bites and doesn’t try to swallow it whole. 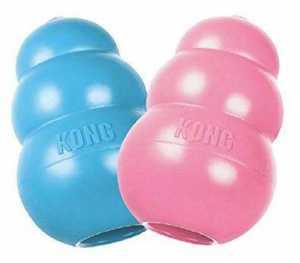 Kong is a well-known industry leader for chew toys – known for its durability. It is a rubber dog toy that will endure years of tough chewing. While it does happen occasionally, it’s very rare that this toy will tear into pieces to become a choking hazard. Just make sure to size the toy to ensure it is too big for your dog to swallow whole. It’s a toy choice that’s safe and it lasts! Some dogs may grow bored of it if it isn’t filled with food since they can’t tear it up and it doesn’t taste good or make noise. 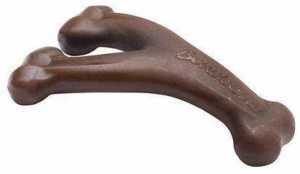 Also from Kong, this bone is shaped so the dog can easily grip it between the paws for effortless chewing. It’s durable and can withstand heavy teething. The great thing about this chew is you can hide treats in each end of the bone to keep it enticing. Dogs love a good puzzle, and this gives them two problems to solve – one on each end! Some dogs may grow bored of it if not filled with food since they can’t tear it up and it doesn’t taste good or make noise. 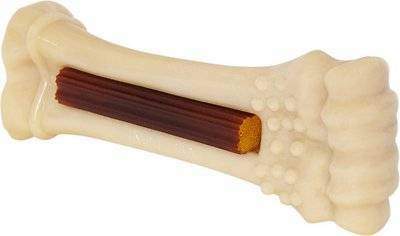 Another fun toy from Nylabone, this chew has the added benefit of multiple textures and links, giving your puppy extra fun with different surfaces. Yet, it’s durable enough to withstand aggressive chewers. The rings also give it a rope-like feel without the dangers of ingesting the fibers. They also make noise when the puppy shakes them, adding to the excitement. These don’t last as long as chew toys, but do bring the added benefit of the puppy actually succeeding in the natural predation instinct and eating the item. They also require a lot of chewing to ingest them; and help teething puppies fulfill the need to eat and chew in one package. These rings also have some nutritional value, with added vitamins and minerals. As with all edible toys, make sure to supervise your puppy to ensure they take small bites – even if you have to hold it for them. This toy from Nylabone combines many benefits into one toy. A durable chewing surface, multiple textures to chew, the ability to hide a treat, or freeze a semisolid treat within to add a cooling sensation to the chewing experience. It also cleans your pup’s teeth with multiple surfaces, gives them a challenge to work at getting the treat out, and can help cool down inflamed gums. I’m not gonna lie, the source of bully sticks isn’t the most appetizing for humans to think about, but dogs love them! 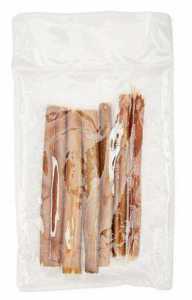 Bully sticks are bull penises that have been rinsed and dried. They have the benefit of being a natural source of nutrition. They are tough and keep your puppy busy chewing from 30 minutes – for the most aggressive chewers – to several weeks for the lighter chewers. 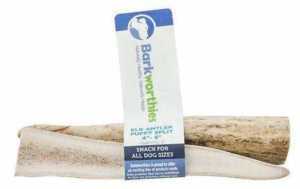 Make sure to look for the bully sticks that haven’t been chemically treated. Like all edible chews, remember to remove them when they become a choking hazard or hold them for your dog to make sure they bite off small pieces. Another natural source of nutrients, especially calcium, are elk antlers. They contain all the ingredients of any meat-bone product. These also tend to last longer than the bully sticks. Most dogs take weeks to chew them down to a size that could be swallowed, which should then be removed. These chews can follow the puppies into adulthood, where they can still benefit from the natural ingredients. Try to limit the chew to just an hour per day to ensure there is no tummy trouble and to give their teeth a break. Just like with all edible chews, remove any pieces when they become a choking hazard. If you’re looking for a good-tasting, all natural edible chew – this is a great buy. 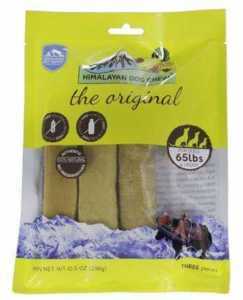 Himalayan chews, as the name suggests, are made from a very hard cheese from yak and cow milk. It’s high in protein and calcium. While many dogs have trouble digesting cow milk, once it’s turned into cheese they have very little tummy trouble. These chews don’t last as long as the antlers, with some pups devouring them in one sitting. As with all edible chews, supervise your puppy and remove the chew when it is small enough to become a choking hazard. This chew toy is flavored with either a peanut butter or bacon-flavored nylon material; which means it will last for some time before it needs to be replaced. Many reviewers claim it lasts as long as the Nylabones. The unique shape also makes it very easy for dogs to hold by themselves. Since this is not an edible chew, make sure to replace it as it begins to wear out. The Nylabone brand is also an industry leader in safe and durable chew toys. 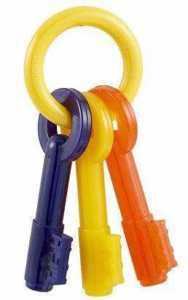 This key ring has the benefit of containing several moving parts so it’s fun to shake and makes noise as they drag it around, but it also has different textures. The multiple-textured surfaces give puppies a choice on their chewing experience, while also cleaning tarter off their teeth. Dogs may lose interest because they can’t taste anything and can’t tear it up. You can solve this by rotating it with other toys so it appears new after a break! What Toys Do Dogs Really Want? By the way, do you know why puppies like cushions and curtains and may ignore that shiny red ball you bought them? Some puppies prefer to chew on their leashes. Why are pups so picky? And how can you buy toys that will hold their interest more than your décor? A study published in the journal “Animal Cognition” examined why dogs loved certain toys and not others. They introduced Labrador retrievers, an especially curious and playful breed, to a single toy for 30-second periods of time until they stopped interacting with it. Their results probably confirm what you’ve noticed with your own puppy. 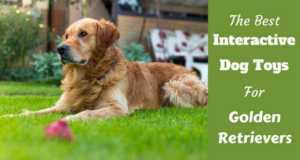 Knowing this information can help you get inside insight on the canine mind to make it easier to keep your puppy interested in the toys that you want them to chew. Dogs look at toys like wolves look at prey. Therefore, if it tastes good, can be torn apart, or makes a noise like something screaming in terror, it’s high on their play-with-the-prey list. Dogs find harder and quieter toys less interesting. If they bite it and they don’t feel the satisfaction of destruction, or hear a shriek of pain, or taste anything yummy, then what’s the point? Dogs are interested in the newest thing. Actually, humans are too! 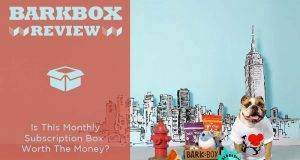 We like the latest shiny tech toy and dogs love anything that they haven’t already gnawed to death nightly for the past month. Dogs are more interested when you participate. That ball becomes way more fun when you throw it and they get to chase it down with all the cunning killer instinct while it runs away in terror! Now, do you understand a little bit better why they like to tear up the throw pillows! It’s a lot of fun to pull the down “guts” out of their fallen victim. Toys that are easily torn – while fun for the pup – can pose a huge risk because the puppy may eat or choke on them. While dogs love to destroy things, you won’t find toys that can be torn apart high on any recommendation list due to the safety issues this presents. Since we can’t give puppies the satisfaction of tearing things up, we must focus on the other incentives to get them to chew, such as taste, interaction and the novelty of a new toy. Puppies lose their milk teeth around 14 to 30 weeks of age. During this time, their regular need to put anything into their mouths will become insatiable. If you pick something that is especially fun to sink their choppers into, they will be more likely to keep chewing on that instead of your curtains or the soft couch cushion. Your aim is to give them toys in order to replace the less desirable household items they gravitate toward for chewing. If you can find toys that better fulfill your pups need during the teething stage and beyond, you won’t sacrifice those family heirlooms to the teething totem. What Makes the Best Teething Toys for Puppies? When your new puppy is teething, a lot is going on in their mouths. They have an incessant need to chew to relieve the pressure of the new teeth erupting through their gums. 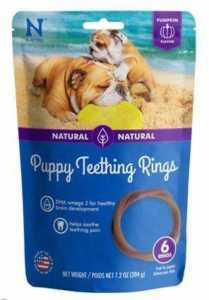 The best teething toys for puppies must be firm and durable or they won’t last long! However, they must also have some give. Soft toys should be considered! Dogs need to feel like they have victory when they bite down, like they would if they were to bite into prey. If the toy is too hard, it may also hurt their sensitive or sore gums. Soft toys might be better for them and their gnawing. The toy also shouldn’t be able to shatter or break into pieces that the puppy could ingest. Many dogs die this way every year, and they will get destructive with their toys if they can. Many more go through unnecessary and expensive surgery to save them from objects stuck in their esophagus or an obstructed bowel. Keep in mind that puppies will eat anything they can swallow. Just like babies, you have to keep these items out of reach and also make sure any toys you give them cannot be reduced to bite-sized pieces. Remember that the dog’s size also plays a factor in toy selection. For example, a toy poodle puppy can safely play with a much smaller toy than a golden retriever. Dogs love toys that taste good. If you want to hold a puppy’s interest, a toy that can be stuffed with treats is a perfect solution. It’s also fun to try different shapes and textures to see what your pet prefers. Dogs are as individual as people. They may seek different ways to alleviate aching gums, and often try several variations to discover what works best. Playtime is more fun this way. Interactive toys can be a fun change. It will keep your dog from being plagued with boredom! They might even stop barking since their toy will distract them. They can even help prevent separation anxiety. Some toys can be dangerous for your puppy. Toys for dogs as precious as yours should be safe! Here are some of the main things to watch out for when buying your pup a toy. Any toy that’s too small for the dog. A good rule of thumb is the toy should always be bigger than the pup’s mouth. A dog with a small mouth has an easier time with this. Toys that can be broken down into bite-sized bits or with detachable parts that the puppy could swallow. 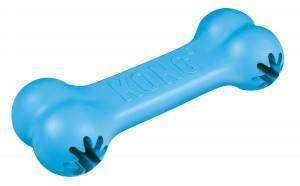 Dog bone dog chews are dangerous because they can break down, so be mindful of this. 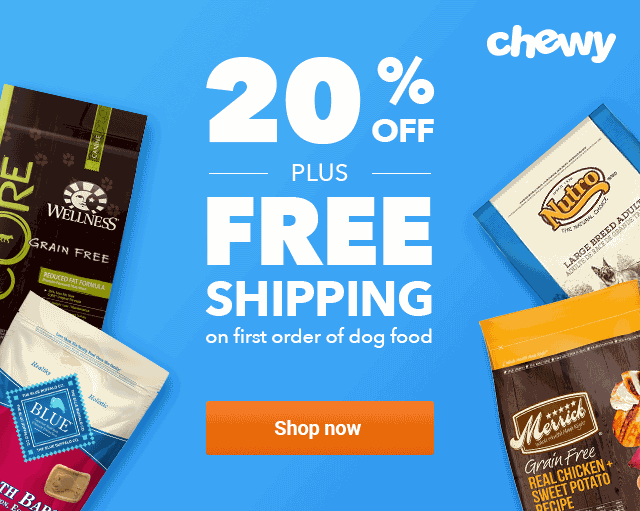 Chewable treats – use with supervision. 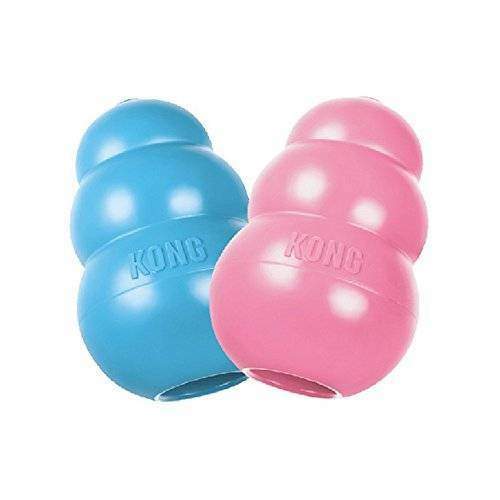 These are helpful when your dog is teething, but you must watch to make sure the pup doesn’t swallow too big a bite. You also need to make sure that the ingredients are safe and won’t cause intestinal blockages. Toys that were made for children. 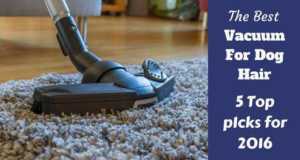 While they may be cheaper, they are not being used as intended. They often can contain unsafe fillings or dangerous parts. Some toys may even have lead or other toxic materials. Stuffed toys that contain plastic, squeakers or batteries are also not a good idea for more than a quick, supervised play session. If your pup tries to de-fluff the toy and ends up eating the batteries or squeaking mechanism, it could become a dangerous situation for them. Squeky can be fun, but it can also be dangerous. You’re careful about choosing dog treats, right? Then be careful about toys, too! The worst thing in the world is if your puppy decides they’re bored with what is theirs and decide to focus on what is yours! Part of avoiding this scenario lies in picking a good teething toy. We will go into some good toy choices in a moment. However, let’s also examine some general ways to keep the teeth and focus on the right things, in addition to the specific toy utilized. Rotate your puppy’s toys so they always stay new and exciting. If you keep a toy out of rotation for about a week and then give it back to your puppy, they will think it’s a brand new score! Make sure to take the toys out of rotation if they are showing signs of becoming unsafe – such as evidence of wear or breakage. Find toys that give your puppy a job to do! This is where toys that can contain treats are a great bonus! They have to work to get to their reward, and pet toys can do that for them. Give your puppy cool toys. Well, they can be cool as in hip, but also cool as in cold. Teething gums can become inflamed. Putting a toy in the freezer is a great way to help your puppy feel better and make the chewing process more fun! To satisfy your puppy’s urge to chew, you need to follow these important tips about dog chew toys. 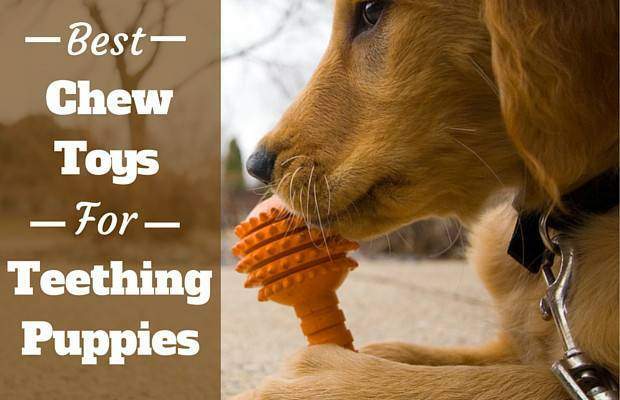 While it may feel daunting trying to find that perfect chew toy to help your puppy through the teething stage, the good news is there is a lot of selection. With a bit of trial and error, you’re bound to find a match to meet your pup’s unique teething tastes while saving your home and sanity in the process! Next time they get the urge to chew, they’ll have the right toy around. Previous: What Should You Put In A Dog Crate And Where To Put It?